Today we have received some exciting news. Three celebrity gardeners, Roy Lancaster, Sir Roddy Llewellyn and Diarmuid Gavin are kindly donating their time to help us with fundraising for the rejuvenation of the garden. They have each very kindly offered to host walk and talk evenings around the garden later this summer. Roy Lancaster will be here on 23 June and Sir Roddy Llewellyn on both 9 and 14 July. A date for Diarmuid Gavin is to be confirmed. If you would like to join one of these celebrities for drinks and canapes followed by a walk around our lovely garden please contact ann.wood@nationaltrust.org.uk or phone 01386 438333. All we need now is some wonderful warm, sunny evenings! We've just started a really exciting rejuvenation project in our Italian House. We have lots planned for the coming few months (including the return of the landscape mural on the wall), but to kick start the whole project the garden team have been busy with some re-plantings. To give the whole area an uplift the fern Woodwardia unigemmata has been planted, along with the sweet little daisy-like flowers of Rhodanthemum hosmariense. Kate has also planted the red flowering Clianthus puniceus, or otherwise known as the Lobster Claw Climber. On Monday we said fairwell to one of our volunteers. Emily had been with us since the new year and has been working on our exciting tennis court project. She also created this blog for us! Another buzzing day passes us all by in the Catering Department. Mother's day has arrived yet again and we were all prepared for a busy day. The sun was beaming bright on us all day and the pork was happily roasting away in the oven. We started with a relatively quiet morning in the restaurant giving us plenty of time to prepare for what we knew was going to be a busy lunchtime. It was busy! Very busy! It was so nice to see so many people enjoying their day out. It was especially good to see lots of people taking their Mum's out for the day and treating them to lunch. It's official. Spring has finally arrived. The first Chiffchaff of the year was heard singing away in the Orchard on Wednesday and the pink magnolia in the Stream Garden is now in full bloom. Although there aren't quite as many flowers as in previous years, the pink clouds always come as a welcome relief after the long winter. Visitors earlier in the week were able to watch as the East Court Garden was transformed in front of them as 800 violas were carefully planted. It will take another few weeks for the 'antique shade' variety to be in full flower, but some are already taking advantage of the glorious spring weather we're currently having. Today marked a truly significant day in our history. Sarah, our Kitchen Gardener planted the first seeds in our newly developing Kitchen Garden. The planting of the Garlic 'Wight Cristo' seeds was officially marked by the obligatory eating of cake and drinking of freshly brewed filtered coffee. To help visitors find out more about what Sarah's planning in the Kitchen Garden we're busy recruiting a team of volunteer Interpreters and Guides. With the help of volunteers, the area will really be brought to life. They will also be encouraging people to set up their own plot and giving helpful hints and tints for a successful harvest. As we're always keen to complement the garden, our Plant Sales Centre have just taken delivery of a great range of gardening equipment and accessories so there really is no excuse not to grow your own! Well the first day of our main open season went without any major hiccups - which came as a huge relief. Things in the garden are a little later than usual this year. 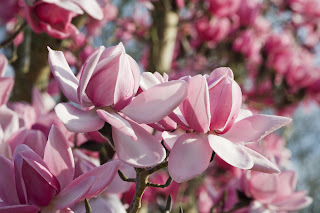 The magnificent pink flowering magnolias which are normally in full bloom by now haven't yet flowered. We're all waiting in anticipation and hopeful that the spell of beautiful spring weather will encourage them on. Some of our fruit trees in the Orchard received a hair cut yesterday when the RHS organised for their regular prune. The training day was a great success with the apple trees now feeling much better and well prepared for their late summer harvest. The thousands of tulip bulbs planted last year have just started to peep above the soil so we've all got our fingers crossed for a magnificent display later in April. Today was a very special day for the catering department, it marks 10 years of service to the National Trust by our Chef. Sarah, fondly known as ‘Splat’ has been a part of the team at Hidcote for more than 10 years but has been on a full time contract for one whole decade, (that’s more than half my whole life!). In true catering department style we decided we couldn’t let the moment pass without a little staff gathering to celebrate, of course it was to be a surprise which meant trickery and deceit...Wonderful! In order not to arouse any suspicion we asked Splat to arrange some nibbles and Patricia (Property Catering Manager) prepared a short speech and purchased the bubbly! Splat was suitably surprised and everybody had a lovely little time! Thanks for all your hard work Splat, long may it continue! As long as you’re looking good! A facelift in true Hidcote style has taken place in The Garden Restaurant. During the winter we decided that a little facelift was in order so Splat (our chef a.k. a Sarah) and I set to work! Job one called for a lick of paint so we set to work with our rollers and brushes with a little help (actually quite a lot) from our trusty volunteer Chris and his friend we were finished in no time at all. Job two called for special expertise and we had just the right person in mind! Plant centre supervisor and expert in all things arty Nicky was just the person to call upon for some advice and a helping hand, she was more than pleased to help. A little bit of sanding and a few coats of Antique white later we had a transformed dumb waiter. Beautiful! Isn’t it great what happens when we all work together! My favourite thing at the moment is listening to the woodpeckers tapping away at the big trees on the driveway. This morning when I went out the sun was shining and the wind from last night had calmed to a gentle breeze, so I thought the forecast might be wrong again. Hail was forecast a few times this week, but didn't appear until about 2pm today, after a flash of lightning and rumble of thunder. It hailed for about 2 minutes, then snowed for about 5 minutes, and is now back to blue skies. In recent weeks the Barn roof has been rethatched, it looks like a new hairdo, the under-cut style that was fashionable for a couple of years when I was at school. There were plenty of people sitting in the sun having coffee on the weekend, and small iris reticulata were selling quickly. 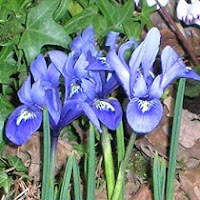 More about iris reticulata. ...like walking on a beach. First impressions from Ros when she came to Hidcote today, walking across the newly re-surfaced courtyard and carpark, done just last week in time for the opening. It is some sort of pea gravel, but I don't know anything more. It seems quite deep and very lightly coloured, but I wonder how long it will last with hundreds of visitors coming and going every week?